« House Shopping 101: “Don’t worry, the City inspected it.” #1:The cut column. This is the second in a series on construction defects found in the Greater Toronto Area, Ontario, Canada. In the photo the flashlight is placed on an uninsulated section of raised ceiling. 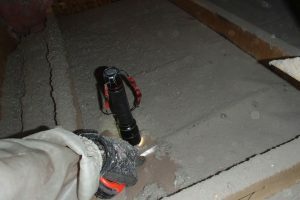 The flashlight is standing on the drywall, and where the light dusting of cellulose is brushed aside, the polyethylene vapour barrier is visible. This is brand new construction in Oakville, completed in 2018. 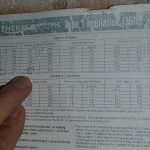 The label claim is for R60 ceiling insulation, which would require about 16 inches of cellulose or a depth of batt material to provide equivalent resistance. Batt type (as opposed to loose-fill) insulation is usually used at raised or sloped ceiling areas. With an R60 claim, typically two layers of R30 batt would be installed, with the second layer perpendicular to the first to provide coverage at the gaps between the batts. What’s missing is batt insulation as shown in this photo from the same house. Note the gap between the batts. It would be better to use multiple, thinner batts and lay them at 90 degrees to each other to cover the gaps. At the gaps, the truss wood is acting like a thermal bridge and allowing considerable heat loss compared to the fully insulated space between the trusses. The dusting of loose-fill cellulose on top of the batts is just over-spray from filling of the main attic area. 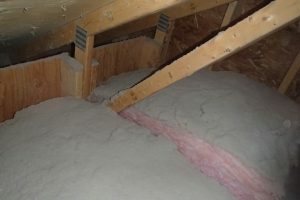 The main attic area is filled with loose fill cellulose. Note the 10 inch depth versus the 16 inch minimum requirement to achieve the R60 as per the installation label. 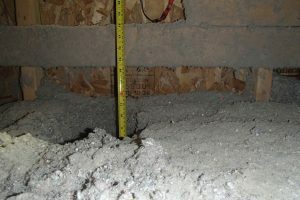 Under-filling of loose fill insulation is a common builder defect. It is not a new defect, and has been occurring for at least 40 years, basically as long as loose fill ceiling insulation has been popular. An installation label can be found at the entrance hatch. Most houses from the 1980s onwards will have a label. The label will show the claimed fill depth and R value for that depth. In 2018 construction, attic (ceiling) insulation could be R50 or R60 depending on which energy compliance package was chosen by the builder. This type of insulation defect ( the missing batts) is not easy to find, it is that the opposite end of the attic from the entrance hatch. A homeowner would only discover this issue based on lack of comfort in the room below, or after some time, by observing water staining or mould on the ceiling caused by condensation occurring under the vapour barrier and soaking through the drywall. Don’t hesitate to have new or nearly homes inspected by a professional. The homeowner now must pursue the builder through the Tarion warranty program to get this made right. The challenge with any work done in the attic is verifying that the remedial work is correct. The homeowner should ask the insulation installers to take photos or provide some other verification of work done. Keith Tripp lives, works and plays in Toronto, Ontario , Canada.